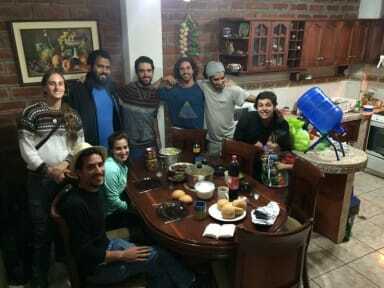 The Viajeros Backpackers Hostel is a cosy family run Hostal right in the centre of Baños. We are happy to welcome long time travellers as well as families. The Hostel has a fully equipped kitchen for your own use. Free Wi-Fi access is available throughout the property. There is also a computer at your disposal. We offer laundry service and are happy to help you to arrange tours and activities in Baños. On the top of our hostel is a place for smoking and relaxing where you can enjoy the great view over Baños and the mountains. Upstairs there is a smoking area and relaxing are where you can enjoy the great view over Baños and the mountains. We speak Spanish and English. 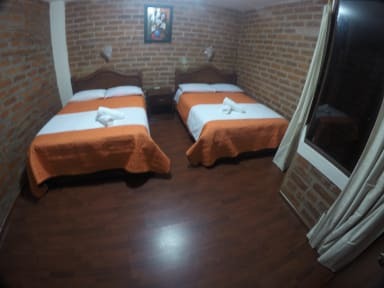 The property is ideally located at a close proximity to many attractions in town, just a block away from the bus station and five blocks from the town's main square. The hostel is located in a very quiet and safe neighbourhood. You can reach the local market and the supermarket in 5 minutes’ walk. The Santuario de Agua Santa church is right next to the market. The property offers comfortable rooms, private and shared. At the moment there are 5 private rooms and 1 dormitory (6 Persons). All rooms have a private bathroom with hot water. The 5 private rooms have a TV. Please note: For all payment by credit and debit card, there is a fee > 12%. Lupe was the perfect hostess!! She showed us how to get around and save money. The hostel was clean and in a perfect location. Lupe even flagged the bus for us and gave us suggestions on what to do in our two days there. Showers were wonderful and hot. I recommend this hostel to everyone!! Lupe is amazing! She was so sweet and friendly and has a very welcoming hostel. It was cozy and the perfect place for us to stay on our adventurous visit to Banos! I would definitely come back again! The rooftop is really sweet also :). Fantastic hostel! We were in quick walking distance to everything we needed, and our room with a private bathroom was lovely and for a great price. There was a cheap laundry service which was very useful, and a water refilling station which we didn’t see anywhere else on our trip in Ecuador. The staff was very friendly and helpful! Definitely recommend this hostel. I loved staying at this cozy family owned hostel. The owners, Lupe and Patrice, are amazing. They go out of their way to help you and can arrange any adventure sport you may want to do, with pickups from the hostel's doorstep. Highly recommend this place if you want to avoid the party hostels and stay in a quieter place. I had a very nice stay at this hostel. It is family run so there is always someone to help you find something in the kitchen or answer a question. They were able to book all my activities at a discounted rate which was super easy. Bathrooms inside the dorms were great, the beds are comfortable and all come with blankets, which you'll need. Towels are included, and you have full access to the kitchen if you want to cook your own meals. Windows are a little thin, so bring eadplugs.